What a difference the right lighting fixture can make! 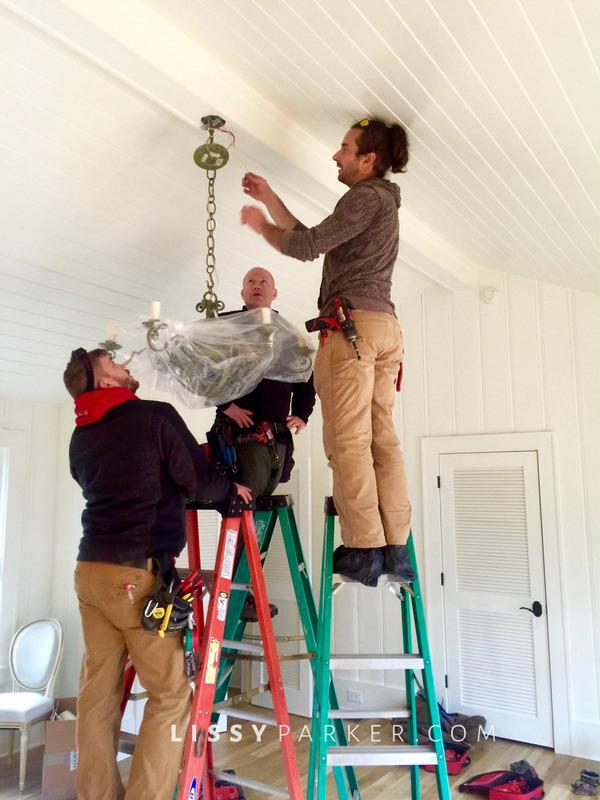 My chandeliers and lanterns are all ready to hang in the the new addition…lovingly named the ‘West Wing.’ The electricians are ready with all of the needed parts, equipment, ladders, bulbs and man power to hang all of the fixtures. The office and party barn rooms have new chandeliers that perfectly accent and light the space, and of course they all are set on dimmers. Thank you Keven Hawkins for finding the most beautiful light fixtures for all of the spaces. The bathroom hall is the perfect spot for the ‘Dog and Bell’ chandelier that was in the kitchen of the Atlanta house. The grill kitchen is brightened with the perfect copper lantern from Ann Morris—I bought two of them at an estate sale here in Cashiers. Copper is one of the top trends for 2017 according to Pinterest—check out my board here. The two large green lanterns are by Ralph Lauren. I found these lovelies at Helen Ballard Weeks estate sale in Atlanta–remember this post and the one on Cote de Texas. Mr.’P’s rustic porch is topped off with this amazing antler chandelier by Chad Collins of Stagridge Cahndeliers. Check out his Pinterest page here. He visited the porch, measure the space and designed the perfect chandelier to fit the space. Take a close look at your lighting today and make any changes you might need—don’t forget to ‘shop’ your basement or storage room like I did. The shades are perfect—just need furniture. This charmer balances all of the Pickwick paneling and stone in this room. This ‘Dog and Bell’ chandelier looks great in the hall. Cooper looks wonderful in the grill kitchen. And there are the green lanterns calling my name—estate sale post here. The rustic porch is the new home for this antler chandelier. They were the best! No one knew what they were—great for me.